AMD has this week unveiled two new additions to its range of desktop processors with the unveiling of the new AMD A10-7890K and Athlon X4 880K processors, which have been designed for those looking for “outstanding gameplay and power efficiency for their desktop PC” says AMD. 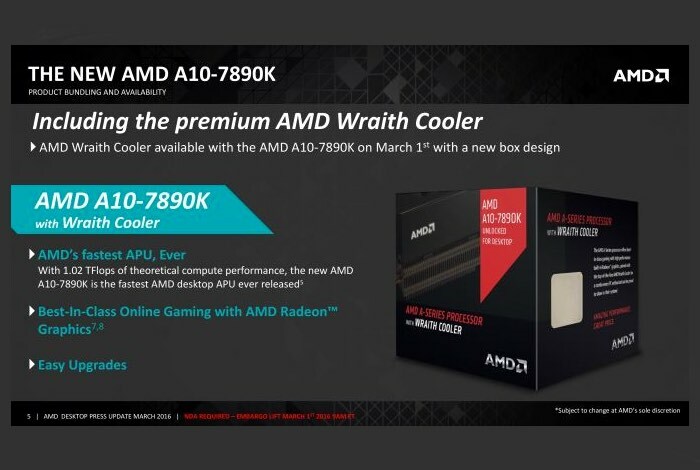 The new AMD A10-7890K is the fastest AMD desktop APU released to date,and offers 1.0 TFLOPS of theoretical compute performance and comes combined with the high performance AMD Wraith cooling system to deliver a high-performance combination, enabling best-in-class online gaming together with near silent operation says AMD. Gamers will be able to enjoy playing the most popular online and eSports games right out of the box on high settings with the new AMD A10-7890K APU, which is capable of providing smooth frame rates in some of the most popular online games like League of Legends, DOTA2, and Counter Strike: Global Offensive. AMD APUs combine the power of AMD processors with the performance of discrete Radeon R7 class graphics in one convenient SoC, and support DirectX 12, OpenGL, Vulkan, and FreeSync in addition to Microsoft Xbox One game streaming on Windows 10. The new Athlon X4 880K is the fastest multi-core Athlon processor ever made, boasting a 4.20 GHz maximum turbo frequency and an unlocked clock multiplier. Paired with the new near-silent 125W AMD Thermal Solution — featuring the same capable hardware and performance of the Wraith Cooler, without the illuminated shroud — this processor delivers high multi-core performance that can deliver extremely high frame rates in some of the most played and popular online games, capable of providing smooth performance at 1440p and 4K when paired with a capable graphics card. A10-7870K APU, now bundled with the new, near-silent 125W AMD Thermal Solution. The proven and powerful A10-7870K now comes with the new, near-silent 125W AMD thermal solution featuring the same capable hardware and performance of the Wraith Cooler, without the illuminated shroud. Jump over to the AnandTech website below for more details.